Plot: Product Description: Leading up to Hitler’s suicide, the film recounts the final days of strategizing and infighting among the Fuhrer’s closest advisors, as well as his relationship with Eva Braun. I have often felt this was an underappreciated film. This British Italian film has a wonderful cast of actors. An exploration of Adolf Hitler’s last ten days inside the Furhur Bunker in Nazi Germany. The movie is something that captures great acting, flawless cinematography, and is directed in a wonderful, stand out way. This film is memorable, and is something to return to often. Olive Films gave a wonderful outlet for this film. A Blu-ray fits this film perfectly. A worthy product to enjoy and speak highly of. Olive Films has allowed this older film to be enjoyed on this new outlet. Another great example of Olive Films choice of sometimes forgotten, or overlooked cinema. This is a Blu-ray product that I think should be owned and enjoyed. Olive Films like always, gives a great Blu-ray product to a film that should be watched. This stars an ensemble cast of brilliant actors. First and foremost is the one and only genius actor, Alec Guinness in the main role of Adolf Hitler. Guinness is one of those actors that was able to bring an emotional reality toward the viewer. He was able to create his characters in a living, breathing reality, and the character of Adolf Hitler is no different. His performance of Adolf Hitler is one of those memorable performances that create the human side to one of the most brutal monsters in all of history. Guinness owned the part and crafted an excellent, emotional performance that stands out. Next I have to mention Simon Ward. Ward is another brilliant example of a flawless performer in films. That is something that makes this film stand out, is the whole cast. The beautiful and extraordinary Doris Kunstmann as Hitler’s girlfriend Eva Braun. Also starring Adolfo Celi, Joss Ackland, Philip Stone, Diane Cilento, Sheila Gish, Gabriele Ferzetti, and Eric Porter. Each performer play off each other with utterly wonderful chemistry. Doris Kunstmann and Alex Guinness are flawless together as two characters in history that are displayed in this film with a high quality of believability. Another example of this film is the music displayed and performed by Mischa Spoliansky. Spoliansky was an amazing Russian born music composer that left the world with a great, vast brilliance, and love of music. Hitler The Last Ten Days was his final film that he composed for. He had composed and worked on many upon many films and TV projects in his life. He passed away in 1985 but left an amazing range of music which can be heard throughout Hitler The Last Ten Days. His music is still used today and most recently for the film soundtrack of Woody Allen’s Magic in the Moonlight (2014). This movie is based on the book written by Gerhardt Boldt. Boldt was a Nazi who was there in the Bunker in the last ten days. The book was titled Hitler’s Last Days: An Eye-Witness Account. Being stationed in Adolf Hitler’s Fuhrerbunker, Boldt was able to attend daily briefings with Hitler, and top Nazi’s. He was able to observe and be placed in a pivotal reality in history. He saw the workings first hand of top Nazi’s such as Martin Bormann, Herman Goring, Joseph Goebbels and the monster himself, Adolf Hitler. His book is an extraordinary journey that firsthand knowledge captured. If you get a chance seek out the book and read it. This movie captures in great detail the inner workings, destruction, and failure of Nazi Germany in the last days, and moments of World War 2. Boldt is played by actor Kenneth Colley in Hitler The Last Ten Days. Colley is probably most remembered for playing the character Admiral Piett in Star Wars Empire Strikes Back, and Star Wars Return of the Jedi. Colley is so much more than that, he is a flawless actor who captured many wonderful examples of characters throughout his vast career. He was a stable as a character actor in many films and TV. This is directed by the Academy Award winning screenplay writer, Ennio de Concini. Concini was a powerhouse in the Italian film world. Interesting is that he only directed 3 films, and Hitler The Last Ten Days was one of those films. His main focus was writing screenplays for film and TV. He had a vast career starting in the 1940’s and went all the way up until the late 90’s. I will always know him from writing the screenplay to one of the great horror films of all time, 1960’s Black Sunday. He also wrote the screenplay for one of my favorite directors of all time, Lucio Fulci’s 1975 western, Four of the Apocalypse. What is also interesting to note about Concini is he had a lot of misses in his screenplay writing. Yes he was an Academy Award Winning Screenplay writer, but he also created films of lessor value and quality. A lot of cheesy, low budget films such as Assignment: Outer Space, and Colossus and the Amazon Queen, amongst many others. Now as I have mentioned he was a talented screenplay writer that did win an award for his writing of the screenplay, for the amazing film 1961’s Divorce Italian Style. This is a great extraordinary film and deserves all the accolades it gets. 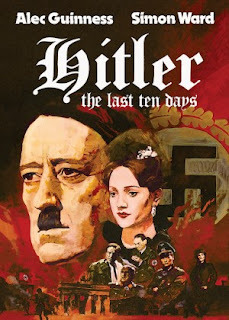 Concini directed Hitler The Last Ten Days as a film to be remembered. He directed a tight structured film with amazing performers. For never being on Blu-ray before, the film looks good. The product is a worthy outlet for this biographical drama. Olive Films did another great choice of film to bring out. I am a huge World War 2 buff and being able to see this, and own this is a great reality. Olive Films always picks great films for Blu-ray, and Hitler The Last Ten Days is no different.